About 40km south of Bandung lies the Rancabali district (also referred to as Ciwidey), a beautiful area of mountains and high plains. It's a rural district with farms and villages, mountains and lakes. Kawah Putih is a volcano crater lake near Rancabali, located at 2430m of altitude a few km south of Rancabali. It covers one of the two craters of Mount Patuha. The lake is highly acid and has a colour which changes from bluish to white-green. Kawah Putih is accessible by road. 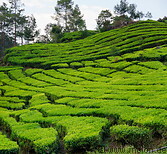 On the hills south of Rancabali there is a tea plantation, one of the largest in West Java with an area of 1500 acres. Nearby lies the Situ Patenggang lake, a small lake located at 1600m of altitude which due to its fresh climate and pleasant surroundings attracts a number of visitors every year. Along the lake there are shops, cafes and restaurants and boat services are offered.